It’s always a challenge to get a hearty and delicious breakfast on the table for us. It’s just so rushed in the mornings. So we’re always looking for shortcuts to make a yummy breakfast. 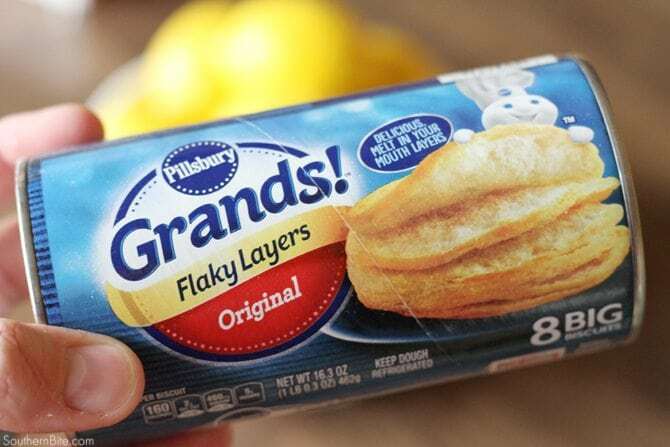 We love using Pillsbury Grands! biscuits just for that. They’re so easy and cook up perfect in no time. 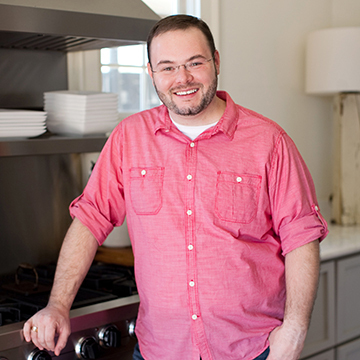 So when the folks from Pillsbury asked me to create a fun and hearty recipe for breakfast using one of their signature products, I jumped at the chance. After seeing a pin on Pinterest about how to use the biscuits to make waffles, I thought… “What if I stuffed those things with more breakfast-y goodness first?” So, you know me… I tried it and it was amazing! 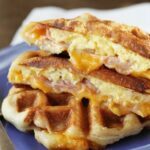 So I present my Ham, Egg, and Cheese Biscuit Wafflewiches! I used ham, egg, and cheese, but you could use nearly anything in the right quantities. Sausage is great in them too! 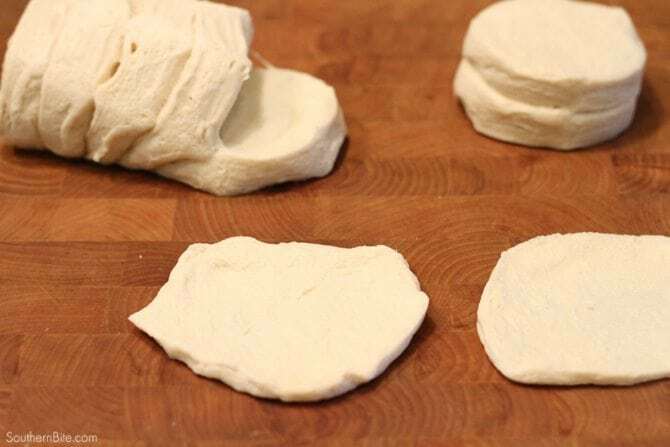 Here we go… Start by separating the Flaky Layers biscuits in half and stretching the halves thin to about 5 or 6 inches across. Slow and steady is the best method for this. Lightly spray a waffle iron (I used a Belgian waffle iron) and place the biscuit-wich in the waffle iron and press the iron flat. Cook 4 to 5 minutes or until it is golden brown and cooked through. Serve them immediately or keep them in a warm oven until they all are finished. There it is! Cheesy, gooey deliciousness! Y’all enjoy! Open the biscuits and separate each biscuit in half. Stretch the layers thin to about 5 or 6 inches in diameter. Top one half of the biscuit with a piece of cheese, a slice of ham, and a generous heaping tablespoon of scrambled eggs. Top with the other half of the biscuit and pinch to seal the edges closed. Place in the waffle iron and close. Cook 4 to 5 minutes or until the biscuit is golden brown and cooked through. 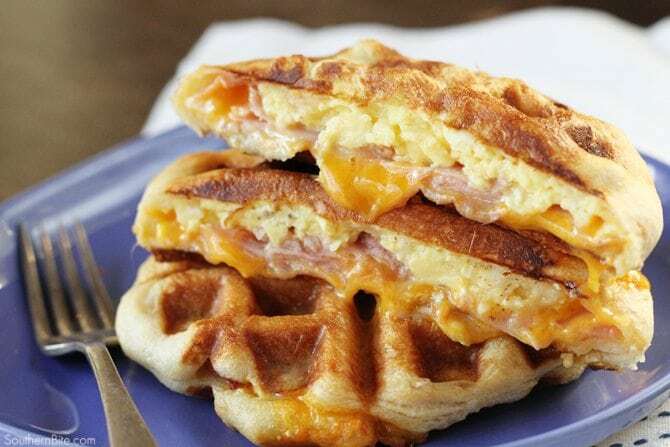 Store the prepared wafflewiches in a warm oven until the others are finished. Serve warm. This looks amazing! I have been trying to rationalize buying a waffle iron. Convinced! Seriously! YUM!!! 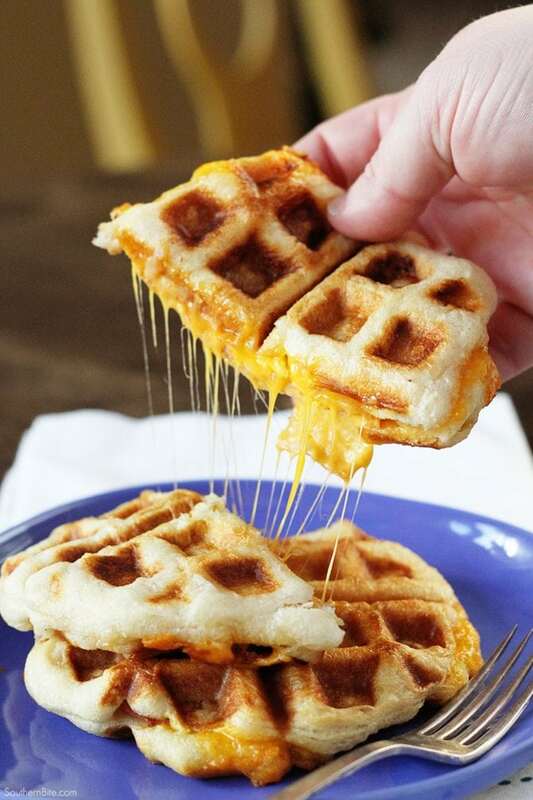 I’m dusting off my waffle iron and making these! It’s totally worth it! Enjoy! What a great idea, Stacey. 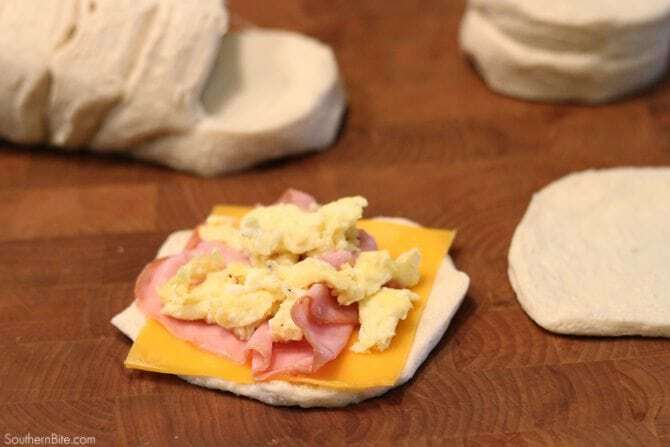 I’m going to make these soon, on our next “breakfast for dinner” night. I hope you’ll enjoy them!! These look yummy. Is there any way to save that whole can of biscuits for future use? 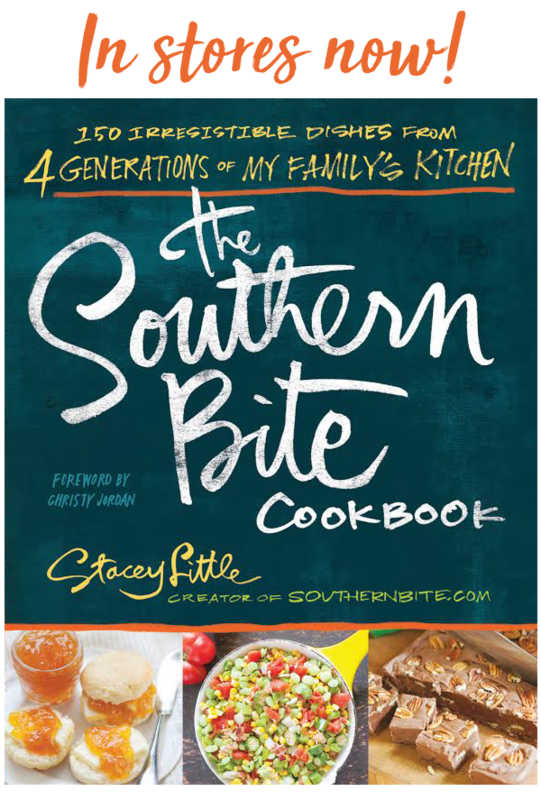 I’m cooking for two adults and always find the crescent and biscuit recipes wasteful because I don’t need to make that many. If I have leftovers, I bake them and then refrigerate them for later reheating. There’s not a great way to store them raw. you can buy smaller tubes of Crescent Rolls and Biscuits, with 4 in a tube instead of 8. That’s what I do. Can you make these and then freeze them? These look really great! I was wondering about freezing them and you say absolutely, but I’d love to know how you reheat them most successfully. Thanks! I usually put them on a sheet pan in the oven at 325° for about 8 minutes or until heated through. I bought the regular home style biscuits…do you think I could use that instead of the flaky biscuits? 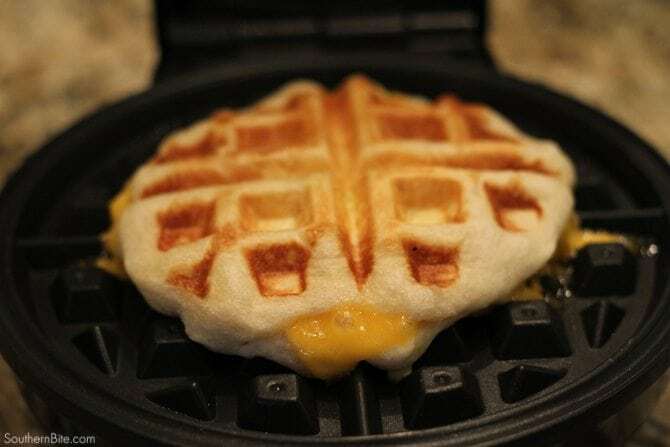 I have a square Belgium Waffle Maker that will make 4 at a time as it is a good size, wondering if I can do 4 of these at once and if I can use shredded cheese instead. I’m making them now in one that makes 4 at a time and they are really big so I decided to just do one at a time and they are good. I am making them and freezing them so I have them for breakfast before work. Made these tonight for hubby and I to take for work in the mornings! They are delicious and so easy! Thank you! Aren’t they good? So glad ya’ll are enjoying them! Hmmm. I think baking them might be the best option outside of the waffle iron. These look amazing! Do you know f they would freeze well? I’d love to make ahead for the week!! I bet you could reheat them in a toaster I’d you sealed the edges well! I’m very disappointed in this recipe. I just made them. The flavor of the biscuit over powers the filling. All I could taste was the biscuit. I was thinking I would press flatter and larger. Also I would add more filling!! My boys loved it. Just made it this morning. Thanks! Awesome! I love to hear that, Anna! Super fun, kids loved them we poured syrup over our finished product. Only thing I’m changing is the egg amount. There was no way I was fitting a full 6 eggs in those biscuits. I will be doubling the recipe and using 6 or 7 eggs for 16 waffles. Love hearing y’all enjoyed them! Syrup is such a great idea here! Goodness I hate to be the one to alter the delicious opinion. My husband and I found them tasteless and dry. They were too big for my waffle iron. They made a terrible mess, which wouldn’t have been a problem if they were delicious. I hate to hear that Susan. 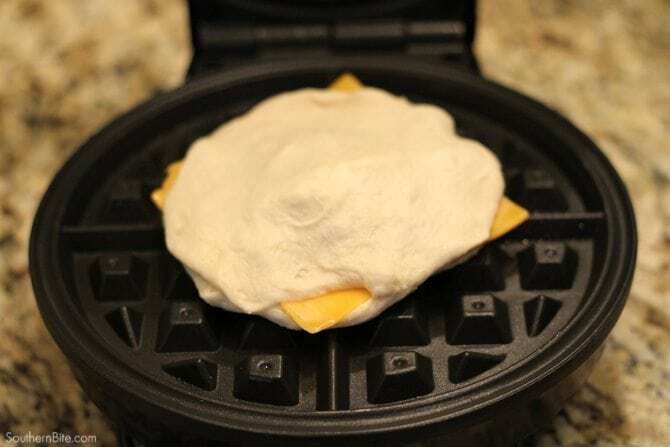 I have two waffle irons, and have never had trouble trying to fit the wafflewiches in there. I have to admit- these were so good I ate more than I’ll admit to here! My work does a fun breakfast competition between doctors and technicians, and this was my pick…. not only did I win but there were so many happy folks that day for our work weekend, nothing could bring us down! So delicious, no issues with anything… the cheese was melty, but it was worth the clean-up! I’m sharing this on my blog, and absolutely giving you all the credit. Ha! I LOVE hearing that, Sam! So glad you won and everyone enjoyed their breakfast!! Thanks for taking the time to let me know! So smart! Best way to reheat most foods. My daughter made these this morning. She had no problem stretching the dough to fit our rectangular waffle iron and was able to seal the edges perfectly (no oozing). Because of this, had there been any leftovers, they could have been popped into the toaster to reheat, as we do when I make a big batch of waffles. You may notice that I said “had there been any leftovers.” Even though everyone was running off in different directions, they grabbed a couple as they went by. There was no fight to get everyone to eat breakfast this morning! At the store, I also picked up pepperoni, mozzarella slices, and canned pizza crust. 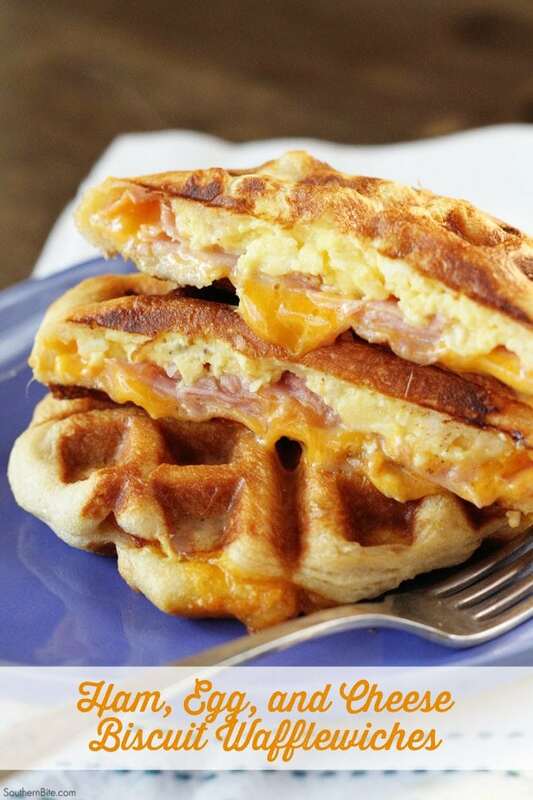 I’m thinking this recipe can easily be adapted to make pizza waffle sandwiches. I got turkey pepperoni for the reduced fat, and I’ll probably lay them out on paper towels and zap them in the microwave for a few seconds to pull off more fat before making them. I got a little jar of pizza sauce for dipping. Hey we use frozen biscuits to reduce waste. Would that work it I thawed them first? Traditional biscuits are a completely different thing. I’m just not sure how they’d work in this case. Has anyone tried pillsbury croissants for this recipe? These are amazing! Tomorrow is my daughters first day of school so I decided I’d make these tonight and warm them up in the morning. I had to try one and…Holy moly! So good. I LOADED them up with lots of the ham and eggs and a slice of cheese and they came out perfect. SO glad they turned out great for y’all!! I wonder if you could use a quesadilla makerto cook them in? I don’t see why not. It’s the same general idea. Do you defrost the frozen sandwiches before baking them? Yes, they’ll ned to be defrosted before putting in the waffle iron. I meant after the sandwiches have been made in the waffle iron and frozen. Do I need to defrost in the refrigerator and then reheat in the oven? Gotcha! Yes, I think that would be best to get the best texture. I’ve a question and don’t know if it is a dumb one but i hope you’ve an answer for me. I’m from the Netherlands, Europe and i can’t buy pre made biscuits here so i’ve to make them myself. Are the homemade as good as the bought ones to make this delicious breakfast? I hope your answer is positive cos i would be very disappointet when it can’t be done! I’ll keep my fingers crossed till i hear from you. I appologize for any language mistakes i probabelly made but since my speaking language is Dutch and i learned my English over 45 years ago i may have make sé real mistakes! I’m sorry for that. I hope to hear from you soon. Have a very nice day and enjoy the nice weather. That is when you’ve just as nice weather as we have today. Hi Marja! Thanks so much for your message! I have only made these with the canned biscuits, but understand that you don’t have those there in the Netherlands. I do think it should work just find with thin pieces of homemade biscuit dough, but I’ve not tried it personally. I have plans to make biscuits one day this week and I will save some dough and try it just to be sure.